Why Be Productive And Does It Really Matter? Why would you want to be a productive person anyway? and your four walls every day. questions are meaningless to both him, and especially – YOU. What goes into your being a productive person? of money, they are happy. to be doing, then NOW is the time to do it. write down what you would most like to be doing. fast food restaurant for minimum wage. He is married with 4 small children. most pleasurable past time is playing video games. 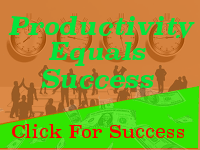 statement will help you to increase your productivity. think is more likely to produce results? yourself in a situation that you just “Can’t Stand”. disgusting, and on and on. Even when you think that you can’t – you can. even you are able to realize.